For the genus of jumping spiders, see Athamas (spider). In Greek mythology, Athamas (/ˈæθəməs/; Ancient Greek: Ἀθάμας "rich harvest") was a Boeotian king. He was a son of Aeolus and Enarete, and sired several children by his first wife, the goddess Nephele, and his other wives Ino and Themisto. Nephele first bore to him twins, a son Phrixus and a daughter Helle; and also a second son, Makistos. He subsequently married Ino, daughter of Cadmus, with whom he had two children: Learches and Melicertes. Phrixus and Helle were hated by their stepmother, Ino. Ino hatched a devious plot to get rid of the twins, roasting all the town's crop seeds so they would not grow. The local farmers, frightened of famine, asked a nearby oracle for assistance. Ino bribed the men sent to the oracle to lie and tell the others that the oracle required the sacrifice of Phrixus. Athamas reluctantly agreed. But, before Phrixus could be killed, he and Helle were spirited away by a flying golden ram sent by Nephele, their natural mother. 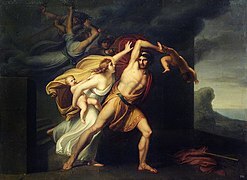 Helle fell off the ram into the Hellespont (which was named after her) and died, but Phrixus survived all the way to Colchis, where King Aeëtes took him in and treated him kindly, giving Phrixus his daughter Chalciope in marriage. In gratitude, Phrixus gave the king the golden fleece of the ram, which Aeëtes hung in a tree in his kingdom. 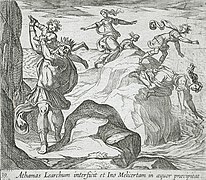 Wikimedia Commons has media related to Athamas.